When I was in college, the data storage and transfer medium of choice was the lowly 3.5″ floppy disk. Holding a whopping 1.44MB, I ferried many a research paper, HTML file and other files from the PC in my dorm room to the various labs across campus. Lose that disc – lose everything. At HighEdWeb 2005 in Rochester, I won a door prize of a 256MB flash drive. It was smaller than a ZIP disc and could hold so much more stuff. Photoshop files, photos, music. It was an exciting new world. I had more portable storage in my hand than was in the computer I had in college. I’ve gone through countless flash drives over the years, ranging from 2GB to 32GB and I’m writing this on a Macbook Pro with a 128GB SSD drive. Other than a fan, there are no moving parts in this laptop. It’s amazing. I’ve quickly filled up that SSD drive with videos, music and InDesign files, so this week I purchased a 64GB MicroSD card and a Nifty Drive so I could have some semi-permanent storage for some of the larger files I don’t access too often. As I was installing this little piece of plastic into a similarly small piece of aluminum and then putting that combination in this unimaginably thin laptop and magically getting a ton more storage on my laptop, I thought about how far we’ve come-how far technology has come-when it comes to storage, size and portability. Cliché? 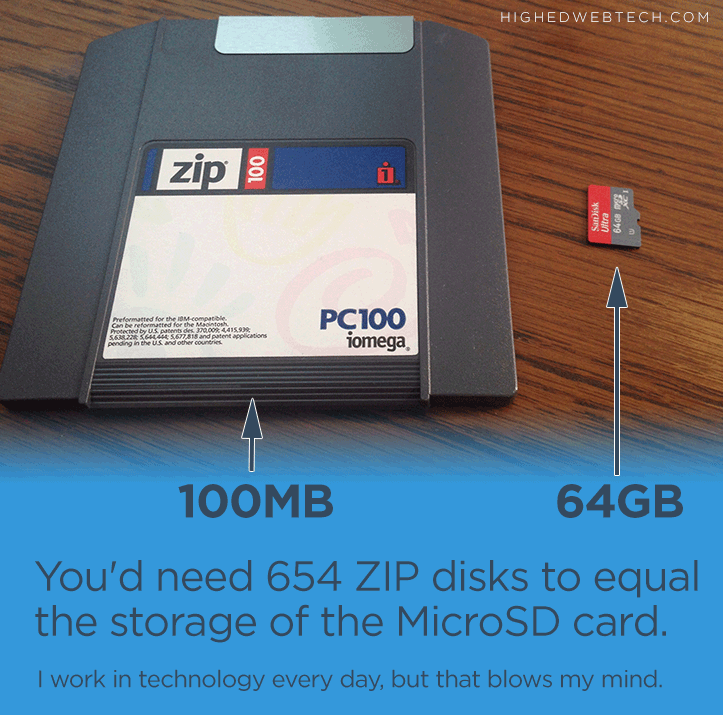 Maybe a little, but think about it – it would take almost 655 ZIP discs to equal the storage I now have on a MicroSD card that weighs 1/3oz? But what’s the future of removable storage? Will we need it in the future? I use Dropbox to share files and collaborate, Google Docs for writing and spreadsheets, and Amazon to back up and serve content for this website. I love the cloud, but the recent Gmail outage only goes to show you can’t control it. And let’s not get started on all the conversations going on now with security and privacy. For now, both me and my MacBook Pro are happy with our new fancy, little MicroSD card. Somewhere a zip disk is crying.